As the weather becomes warmer, you can extend your home's indoor living space to the outdoors. Entertaining family and guests outside is fun and easy. No matter the size of your outdoor living space, having comfortable, functional and beautiful furniture is essential. But, high-quality outdoor furniture can be a big investment, and with so many options available, how do you know what to buy? Here are 10 tips for choosing outdoor furniture and accessories. 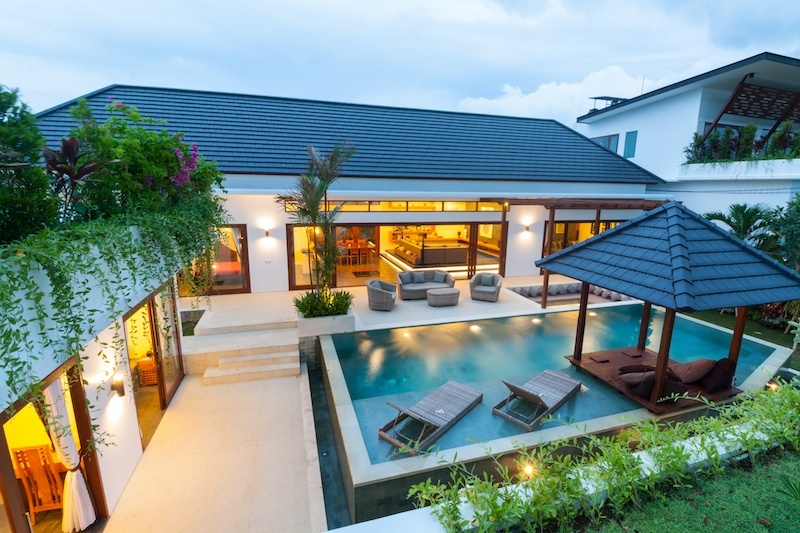 The first step is to consider how you want to use your outdoor living area. Do you plan to have big barbecues or have intimate candlelit dinners? Would you like to have a cozy, shaded nook where you can relax and read? If you have a pool, do you need furniture for a lounging area? Would you like a gathering space around your outdoor fireplace? Think carefully about how you can designate different zones in the space for different purposes. 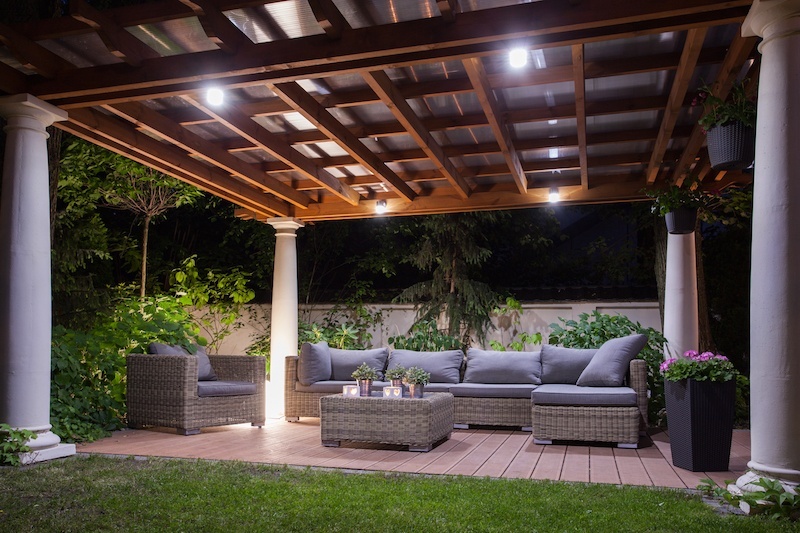 Take the time to measure your available space before you buy any outdoor furniture. Take the measurements with you when you go to the store or when you are looking online. Keep scale and proportion in mind. In other words, oversized pieces of furniture will make a small patio appear smaller. Conversely, large patios or decks need substantial pieces of furniture to fill the space. Before you go to a store, do some research online. Check out websites that sell outdoor furniture and see the different styles, materials and price points that are available to you. The style of your home's architecture and decor should be reflected in your choice of outdoor furniture. With careful planning, your outdoor living area can look like a seamless extension of your indoor living space. Consistency of style and design is key. Outdoor furniture made from natural wood is beautiful, but it does require maintenance. Regular sanding and sealing will keep wood furniture looking new and will protect it against the elements. Choose furniture made from dense woods such as teak, redwood or cedar as they hold up better over time. Avoid wood furniture that has been glued together. Wicker is a style of weave. Rattan is a naturally grown vine that is used in wicker weaves. Today's wicker furniture is typically made of synthetic resin that has the same appearance as natural rattan but is much more durable. Synthetic resin outdoor furniture is constructed on an aluminum frame, which makes it lightweight and low maintenance. Wrought iron furniture is sturdy and durable. Look for pieces that have powder-coated weather resistant finishes. Wrought iron furniture will require painting or having a weatherproofing finish applied periodically so that it does not rust. Since wrought iron is a heavy material, your outdoor furniture will not blow away in high winds. However, make sure you can lift and slide dining chairs and other pieces that you will need to regularly move around your porch, patio or deck. Like wrought iron, steel outdoor furniture is sturdy and durable. It is resistant to rust, but will require periodic applications of paint or a weatherproofing finish. Steel is even heavier than wrought iron and can be very expensive. Aluminum outdoor furniture is durable and easy to maintain. Aluminum does not rust, but look for furniture that has a powder-coated finish and rustproof hardware so it stays looking great for a long time. Since aluminum is a lightweight material, be sure to secure your outdoor furniture during storms and high winds. Furniture made from durable plastics requires little to no maintenance. It cleans up easily with soap and water and never need painting or sealing. Look for plastic furniture with fade-resistant coloring. Plastic outdoor furniture is relatively inexpensive. When you are shopping for your outdoor furniture, take some time to really check out the quality of the pieces you are considering. All joints should fit tightly together with no gaps. Metal furniture should be painted or have a powder-coated finish that is uniform and will prevent rust. Wood furniture should have a sanded, smooth surface. Wicker should not be unraveling or loosely wound on the frame. Tables should not wobble. Chairs should be comfortable and sturdy. Cushions make hard outdoor furniture comfortable and more visually appealing. There are many fabrics that can add beauty, color and design to your outdoor space, but choose wisely. Pick fabrics that are meant to be outdoors. Typically, the best outdoor fabrics are made from solution-dyed acrylic that resists fading, staining and mildew. Spun polyester dries quickly and can be less expensive, but it can fade and look worn over time. For comfort and style, add some throw pillows in colors and patterns that complement the fabrics you choose for your furniture cushions. 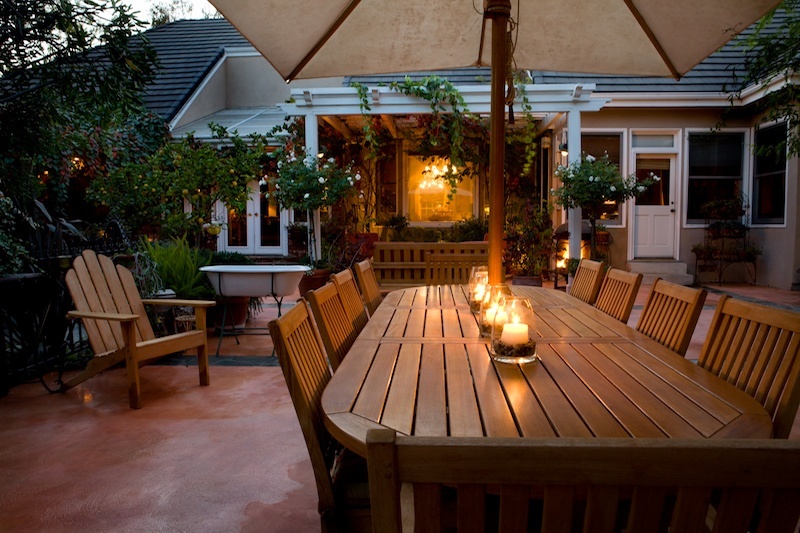 Outdoor dining tables typically have a hole in the center where you can put an umbrella to shade you from the sun. If you need an umbrella poolside or for your lounging area, you can buy a freestanding, cantilevered model. They can be moved around as necessary and provide an extra pop of color. Choose umbrellas with wind vents, a sturdy frame and a solid base for safety. A rug can add the final flourish to your outdoor living space. Choose one that is made to be outdoors and can be periodically hosed off or easily swept. 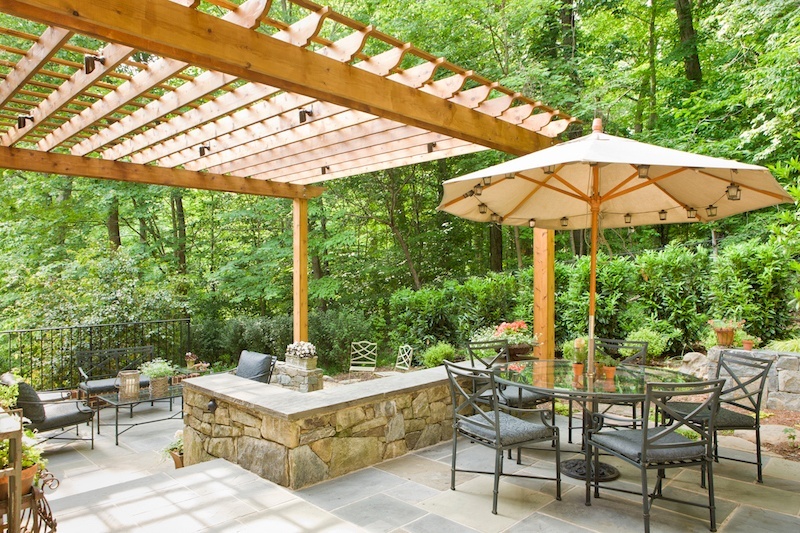 Most often, outdoor rugs are used in a screened in porch or under a pergola. Pick a rug that complements the style and color of your new furniture and completes your design. To ensure that your outdoor furniture and accessories will look good for years to come, store it all inside your garage or shed, or cover it all up, during the winter months. During the warmer months, make sure you clean your furniture periodically and maintain it as recommended. Stand up cushions after a rainy day to make sure that they dry out and do not mildew.